I was talking with a friend of mine, Erica Dunham, recently. It turns out that she Googled herself and all she found was a series of references to that other Erica Dunham. The one from the industrial rock band Utter Null. Even when she Googled "Erica Dunham" + London, England she still didn't find anything that related specifically to her. It seems a shame to me that someone as cool as her would not have single reference to her on the entire world wide web. And now here it is. A blog post about Erica Dunham of Ann Arbor, Michigan and London, England. 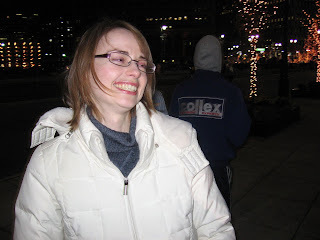 Complete with a photo of her from Detroit Synergy's Shop Detroit event back in December of 2005. Welcome to the Googleverse, Erica! I saw this sign in Eastern Market, near Butchers Inn. It just cracked me up. Within minutes of this photo being taken, though, workers from the City came along to replace this stop sign with a non-graffiti version. 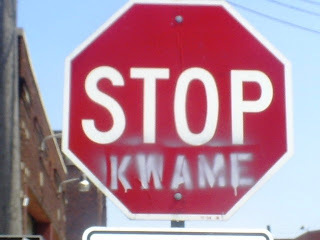 The question is: did this graffiti pundit want us to stop Mayor Kwame Kilpatrick or City Councilman Kwame Kenyatta? The SAE 2008 World Congress is now over. One of the cool things about this annual event is that there are always lots of cool, swanky parties after the official business. Of course, the coolest thing about the SAE World Congress is that if you put on a suit and act like you belong, you can usually walk right into these cool, swanky parties to score some really good free food and free booze. I had to work late both Monday and Tuesday so I didn't get to crash any of those parties. Yesterday, however, was a different story. I was free for some quality party crashing. I started my evening off at Coach Insignia where I managed to get into a private party that was hosted by the British Consulate. 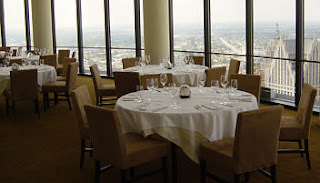 The food was top-notch (it was held at Coach Insignia, after all) and the booze was plentiful. I even picked up three toy-sized Mini Coopers that they were giving away as swag at the door. Miss America Kirsten Haglund has been filling in for a lot of prominent leaders as of late. First, she threw out the first pitch on Opening Day for the Detroit Tigers. That duty would normally be done by Mayor Kwame M. Kilpatrick, but he's been a little busy as of late with the whole text message scandal and being under indictment. It also turns out that will be filling in for Governor Jennifer M. Granholm at the Tulip Festival in Holland, Michigan. Governor Granholm is reportedly embarking on a trade mission and the schedule for that will conflict with the Tulip Festival. This makes two instances in less than a month where Kirsten Haglund substituted for someone at a high-profile event. I wonder: what will she do next? Well, there is the fact Pope Benedict XVI has said that he won't be available to attend the White House dinner that President George W. Bush is holding in his honor this week. Is it possible that Miss America Kirsten Haglund could fill in for the Pope? The folks at MoveOn.org created what I think is a brilliant video that demonstrates how President George W. Bush and U.S. Senator John McCain are essentially leading us into that famous 100 years of war, 6 months at a time. I read Sun-tzu's writing as a cadet in the Air Force ROTC. It's too bad that more people in Washington, DC haven't read the basic reading list that was handed out to first-year cadets. Okay - this one is only sort of about Mayor Kwame M. Kilpatrick. 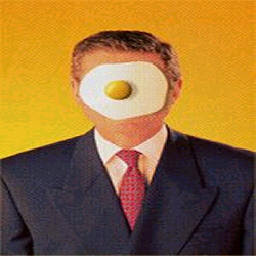 His face is one of those that appear in the video. Still, it is so darn funny. Originally uploaded by ftfesz71 Sometimes my friends find the funniest damn things on the web. And this is unquestionably one of those times. Thank you for finding this, Liza! This is too darn funny! I'm only upset that I didn't think of it first. I posted a simple experiment two weeks ago. I wondered how many people who visit my blog simply by me adding the words Kam Carmen into a blog post. The answer to that experiment is 197, thanks to data from Google Analytics. And now I wonder something else. Let's just say - hypothetically speaking - that some random blog were to publish a post about the marital infidelities of some random television and/or radio personality as well as about her subsequent divorce. This would be even more interesting if this television and/or radio personality had gone our of her way to put her marriage in the public realm by - oh, I don't know - getting married on live television during a news broadcast. As I ponder the possiblity of this happening, I can't help but wonder: how would said television and/or radio personality respond? The way I see things, this person would have two options.